Sometimes soft-start valves can prevent cylinder, actuator and tooling damage on your air-driven equipment. Here’s more about them, information you’ll want to know if you are designing or building a pneumatically driven machine. While perhaps not critical on a small, one or two air-cylinder piece of equipment, more complex machines may have dozens or hundreds of air cylinders or other air actuators, many running at very high speeds, and all finely timed to ensure that they will not interfere with each other when the equipment is running. When that machine is being set up or being repaired, it is normal for the compressed air to be completely emptied from the machine with no compressed left in the air lines, air valves, or air cylinders. This is both for safety for the operator, and to enable a mechanic to easily move the air-driven tooling as they go about building, setting up, or fixing a piece of equipment. Once the installation or maintenance work on that piece of equipment is complete, it is time to get the machine operational. Industrial air mains will typically be pressurized well over 100PSI. What you do not want to do then is fully crack open a high-flowing main air valve and have fast-moving compressed air flooding the lines and pressurizing all of the air cylinders on the machine all at once. Some of the air cylinders and other air-driven actuators will be in the correct position. Some will be left at mid-stroke, and others will be in the extend position when they are supposed to be in the retract position on start up, or vice versa. that’s almost inevitable if a mechanic has been working on the machine. How would they know the start position of every cylinder? At start up there is no air in any of the lines. This means that even if the cylinders have flow controls, which work on controlling back pressure, there is no air in the cylinder to allow the flow control to moderate the speed of the cylinder piston. By introducing air at full line volume and pressure, any wrongly-positioned air cylinder will respond at high speed with possibly catastrophic results. It is possible that cylinder pistons will crash into the end caps. Expect various end-of-rod tooling to collide. Think about the possible damage to the machine components as all these cylinders race to their home position. That’s why a machine will perform more safely with a soft start valve. To prevent having to repair or to rebuild your equipment… again, consider installing a Soft-Start valve. A soft-start valve will, at first, open the air flow to the machine just slightly. It will allow a very low flow of compressed air into the entire circuit, feeding the various actuators and bringing them slowly up to full operating pressure. In so doing the gently flowing air will allow cylinders to cycle,very slowly and softly,to their home positions on the machine. No crashing, no banging, no damage to cylinders, tooling or other components. Once all of the air-driven equipment on the machine is up to a threshold of line pressure, during which all the cylinders reach home, then the soft-start valve opens fully, allowing the full volume of compressed air into the machine and it is ready to do work. There are a number of styles of soft-start valves and ways to build a circuit with soft start inherent in the design. One way to emulate a soft start valve is to install a 3 ported, 2 position manual valve upstream from the machine. This will allow the operator to shut off the compressed air supply to the machine completely, and should allow the air already in the machine to bleed back upstream and out the exhaust port on that valve. Caution is advised. It may be expected that all the compressed air will be dumped from the machine through this 3/2 valve. Depending on where the air valves are positioned, however, there may still be some compressed air trapped in cylinders on the machine. Before starting work, make sure that the component you are working on is completely void of compressed air, and that no adjacent equipment is still charged. Any component with compressed air still trapped in it might inadvertently shift or activate suddenly! When it comes time to re-start this machine, the operator manually opens this 3/2 valve a small amount and allows air to bleed back into the equipment slowly, until all actuators have shifted and the air circuits are full. At this point, the operator opens the valve all the way, and the system is ready to go. 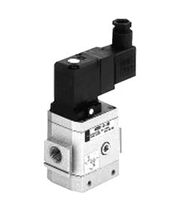 Automatic soft-start valves are available in a variety of configurations and styles. They can be electrically solenoid operated liked the one in the photo earlier on this page, they can be pneumatically operated, or involve a combination of the above. Regardless if the soft start valve is solenoid or pneumatically operated, an integral pressure regulator senses the downstream pressure. The soft start valve cannot open fully until the downstream pressure reaches the soft start valve set point. Once the downstream pressure gets to the set point, the valve opens fully to allow full flow of compressed air into the apparatus. Installing a soft start valve upstream from the machine could save a lot of aggravation in replacing damaged components on the machine due to cylinders reacting to a high inflow of compressed air on start up.